BERLIN (Reuters) - Chancellor Angela Merkel, vowing to stay in office despite stresses at home and abroad, said she would work on Germany's "under pressure" relationship with the United States but that Washington could no longer be relied on to deliver world order. At a wide-ranging news conference, Merkel described Germany's relationship with the United States as "crucial", even after U.S. President Donald Trump last week accused Berlin of being a "captive" of Russia due to its energy reliance. "However, the transatlantic working relationship, including with the U.S. president, is crucial for us and I will carry on cultivating it," she added. "I think it is a horrific thing that's being done when you're feeding billions and billions of dollars from Germany primarily ... into the coffers of Russia," Trump had said during a trip to Europe. The chancellor, a conservative who grew up in Communist East Germany, instead welcomed Trump's invitation to Putin to meet in Washington this autumn and said it should become normal again for U.S. and Russian leaders to meet. "We can't rely on the superpower of the United States," Merkel said. The chancellor, who is serving her fourth term in office, noted that transatlantic ties had been marked by many conflicts in the past, and said: "I hope that we can find the strength to take things further." She expressed concern over Trump's threat to impose new U.S. tariffs on imported cars, and said the United States "does not always pursue policies on which we have the same opinion". Merkel described the possible U.S. tariffs on imported cars as "a real threat to the prosperity of many in the world". "We don't want these tariffs. We think we'll hurt each other - they won't just hurt us in the European Union - they could have much more far-reaching consequences," she said, adding on trade: "We have a very serious situation in the world." U.S. tariffs on imported cars would slash around 6 billion euros ($7 billion) off German economic output, the president of Germany's DIHK Chambers of Commerce said earlier. If talks fail to result in a deal with Washington that conforms with WTO rules, the EU could impose countermeasures "but that is by far the worse solution," said Merkel. The news conference was Merkel's last appointment before she goes on holiday after a tumultuous period marked by Trump's criticism and a row over immigration with her Bavarian allies that she resolved earlier this month. 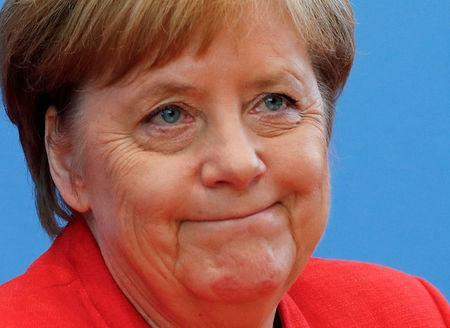 Asked if she was exhausted, Merkel, who has been in office since 2005, replied: "I can't complain. These are demanding times." She also called them "exciting times."